Leaving home, alone, for the first time was definitely the first of the many new things I experienced that caught me off guard and had a lasting impact throughout the trip. That sense of being alone wasn’t necessarily bad though, it gave me a sense of freedom, a sense of individualism going into the trip. Soon after, however, I found that I wasn’t entirely alone. I found myself in the company of Chloe, a Micronesian from Chuuk, together we traveled to Canada, I had found someone similar to me and had begun to feel more comfortable going into the expedition. For the next few days we roamed the city of Ottawa, getting a chance to try local food, or “country” food as they call it. We walked around the city market watching street-performers and musicians, visited museums of history and nature and a gallery of Canadian and Inuit art, and cycled around the city to the waterfalls at the end of the canal. Once our tour of Ottawa had concluded we embarked on our expedition starting with a flight to Resolute Bay, one of the northernmost communities in Canada. Before I go into this next section please keep in mind that Palauans were NOT meant for cold climate at all. I’ll be honest once the doors of the plane opened and the slightest touch of the Arctic winds touched me I was ready to go back to Palau. Being from a place that is normally 30-40°C to 0° was a total shock! That intense cold was so foreign to me. As I got off the plane I saw my breath for the first time in that 0° cold and kept breathing just to see it over and over again until I couldn’t see it anymore. Finally when it was time to board the zodiacs, which are small rubber boats that use inflated pockets to stay afloat, I saw it for the first time, ice. This was the first time I had ever seen ice just floating in a body of water, excluding the ice I get in my iced tea or water, this was a joke I had told countless times throughout the expedition. Throughout my time aboard the Ocean Endeavor I was able to experience so much. Each day we were given a presentation about something new and exciting, along with that we participated in workshops that tested both our hands on skills and overall knowledge. Each workshop was designed to accommodate everyone’s personal style of learning from artful crafting workshops to scientific data analysis workshops. Off of the Ocean Endeavor we were given the opportunity to go on hikes to arctic glaciers and rock formations and mountains, go standup paddle boarding and kayaking around various fjords, and even do some fishing and foraging around certain areas. All in all the expedition was great educationally but what really had a lasting impact on me was the hospitality and warmth of the staff, students, and people I met along the journey. Throughout the entire expedition I was met with nothing but open arms and warm smiles. Each and everyday everyone would meet and be glad and we would all enjoy the day conversing and joking, each of us enjoying each other’s company. The atmosphere surrounding our group reminded me of my home and my family, and soon enough that’s what we became, a small little family nearly 200 strong all connected by the experiences and stories we all shared. My hope is that ALL future expeditions will develop a bond similar to ours and that each and every student and staff may stay connected as alumni and family. 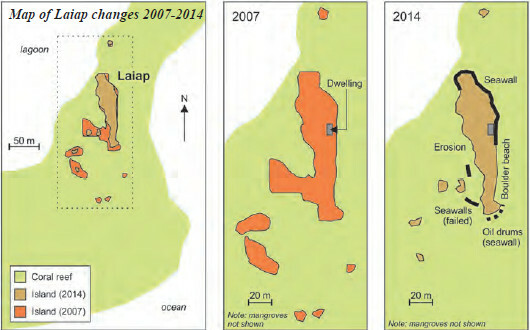 Pohnpei’s shrinking reef islands: an impact of climate change? FSM—Many readers will be familiar with the small beautiful islands, covered with coconut palms and fringed with white-sand beaches, that sit on the edge of the coral reef off the south coast of Pohnpei. From Dawahk in the west, through Nahlap and Laiap in the center, to Nahpali way out east, these islands have been a feature of Pohnpeian geography for hundreds, perhaps thousands of years. But there are not as many islands as there were once. 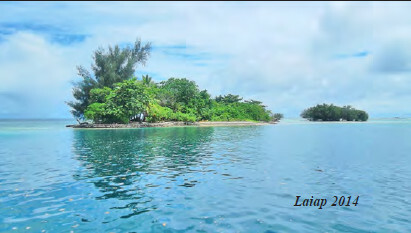 North of Kehpara, according to Ertin Poll, there was once an island named Kepidau en Pehleng that has now disappeared. And northeast of Penieu, there was a famous island named Nahlapenlohd. This island was so large that in the year 1850 it was the site of a pitched battle; some stories recall that fighters hid behind coconut palms to avoid musket bullets. But today, there is no sign of Nahlapenlohd, not even a mound of sand marking where it once was. Perhaps, as some stories tell, so much blood was spilled during the battle that it washed all the vegetation off the island, leaving it exposed to erosion by the waves. More likely, the rise in the ocean surface (sea level) that has been affecting FSM for several decades is responsible for the disappearance of Nahlapenlohd. Although there have been minor fluctuations, sea level has been rising in most parts of the Pacific for the last fifty years or more. Over the last twenty years, sea level has been rising faster than the global average in FSM-Palau and in Solomon Islands. To understand the effects of this, a recent study was conducted by Patrick Nunn and Roselyn Kumar from the University of the Sunshine Coast in Australia with Augustine Kohler from FSM’s Department of National Archives, Culture and Historic Preservation. The research team visited ten reef islands off the south coast of Pohnpei and found that some of them – not all – were showing signs of erosion consistent with the effects of rising sea levels. While islands like Dawahk, Kehpara and Nahlap on the sheltered (leeward) side of Pohnpei showed little sign of erosion, those more exposed to waves and wind from the east did. These include the island of Nahtik, which is estimated to have lost 70% of its 2007 landmass, and Ros which has shrunk by about 60% since 2007. The sand strip that once connected Dekehtik and Na off the southeast coast of Pohnpei seems to have disappeared some time in the last twenty years. When sea level rises, it forces changes to the shape of sandy beaches. It removes material from their higher parts and dumps it offshore. This is known as the Bruun Effect and is believed to be responsible for most of the shoreline erosion that has been observed over the last few decades on many Pacific Islands. While it is difficult to be certain, the weight of evidence suggests that sea-level rise is behind the disappearance and shrinking of the sand islands off Pohnpei’s southern reef barrier. But there is some better news. Patrick’s team found hardly any evidence of shoreline erosion consistent with sea-level rise along the fringes of the main island in Pohnpei. This is hardly surprising considering that most of it is cloaked by mangrove forest – and it does underline the importance of preserving mangroves. Throughout the Pacific Islands, mangroves have been shown to be the best way to protect shorelines from erosion associated with sea-level rise. The researchers also visited Ant Atoll, where no clear signs of the effects of sea-level rise could be observed. 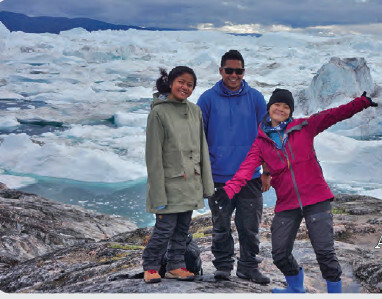 When I was introduced to the Coral & Ice Exchange program developed by Island Research & Education Initiative (iREi) and Students On Ice (SOI), I was drawn in by its goal which was to educate youth about climate change. As an islander, I first learned about climate change through my school, where it taught me that climate change would impact the people living on small islands like mine. So when the opportunity presented itself -- a trip to the north to learn about climate change -- I had to take it. And believe me, the Arctic expedition was an eye opener. Before the expedition, I thought the impacts of climate change were only affecting my islands. I only knew climate change in the perspective of an islander. When I went on my expedition to the north, I began to see climate change from different perspectives. I learned that this is a shared issue. In the North, people suffer tragic loss every year because of global warming. The melting ice in the North is causing huge environmental, cultural, and social changes. Sea level rise threatens low lying islands in the Pacific. All over the world, natural disasters occur. I thought I could not do anything to help and that I could only sit by and watch these problems happen. The expedition told me otherwise. The trip taught me that no matter how young I was, I could still join hands to help prevent climate change. The Arctic expedition offered much more. The expedition offered a chance to see what an island girl like me could only see in pictures. On every daily excursion on land, I was amazed by the beautiful landscape, the ice caps, glaciers, sea ice and the living organisms. The islands I visited were filled with so much history about the Inuit and past whalers and explorers. I got to learn about the history of the Inuit on one of their historical sites. I could only imagine what they had gone through during the winter and how much hardship they had to endure. The trip to the north introduced me to the fascinating Inuit culture. A culture that was so similar to mine. Who knew places so distant could share so much in common? For me, learning about their culture was one of the best highlights of the trip. The Arctic expedition was indeed an experience of a lifetime. For a while, I could not believe that I was actually in the north. Because of this expedition, I now know what I want to become in life. This was so much more than a trip to the North Pole. I was taught to get out of my comfort zone and experience new extraordinary things. I learned and experience so much in less than three weeks. I met so many wonderful people from all across the globe. We created friendships that are sure to last and help us in the future. By the end of the trip, we all had one ambition which was to protect the planet.